Offers a visual approach to learning about the wonders of our world. This title uses the CGI technology to help you explore what you wanted to know more about, covering space, Earth, nature, the human body, history and culture, and science and technology in incredible detail. The family encyclopedia that shows you the world as you've never seen it before. DK Knowledge Encyclopedia offers a fascinating and ground-breaking visual approach to learning about the wonders of our world. 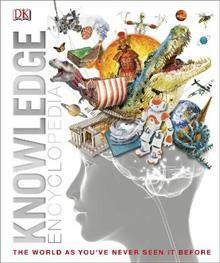 An encyclopedia like no other, the DK Knowledge Encyclopedia uses the latest CGI technology to help you explore everything you've ever wanted to know more about, covering space, Earth, nature, the human body, history and culture, and science and technology in incredible detail. From 3D images of the sun and the inside of a shark to a 3D DNA strand and a model of Shakespeare's globe, this is an amazing visual introduction to every aspect of human knowledge. The DK Knowledge Encyclopedia makes tough subjects not only easy to follow, but utterly absorbing, making this an incredible reference book the whole family will return to time and again.